[vid 2013] Radical Remission Survivor Interview: Chris Wark (colon cancer) RRP Founder Dr. Kelly Turner, PhD interviews Chris Wark, a Radical Remission survivor of colon cancer. After having surgery for his Stage 3 colon cancer at the young age of 26, Chris' intuition told him not to do the recommended chemotherapy, but instead try to heal his body by super-charging his immune system. He successfully did this via dietary changes, supplements, exercise, and mental/emotional shifts, and is here to tell his story 10 years later. Read more at http://www.RadicalRemission.com / and Chris' blog, http://www.ChrisBeatCancer.com/ . [2012 DVD] Cut Poison Burn Cut Poison Burn is a controversial, eye opening, and sometimes heartbreaking documentary that puts the business of cancer treatment under the microscope. Follow the frustrating journeys of critically ill cancer patients as they try to navigate the confusing and dangerous maze of treatment and encounter formidable obstacles in the “cancer industrial complex.” A compelling critique of the influence of medical monopolies, the power of pharmaceutical companies and government agencies, Cut Poison Burn is essential viewing for anyone and everyone touched by cancer. [Simincini, Dr. Tullio ] We watch in face the cancer: the seen tumor gives near. Interview to the Italian oncologist dr Tullio Simoncini. The cancer is a fungus. In this 2h long video Dr. Day reveals the true causes for our diseases and gives the astonishing answers on how to get well living a healthy lifestlye and eating natural food thus improving our immune system. In addition, she exposes the disastrous side effects of the drugs used to treat these disorders. Discover the cause of your disease and find out how to get well. Dr. Lorraine Day herself developed severe advanced cancer and almost died - which became her supreme motivating factor for finding out how to get well. She recovered by natural methods, without chemotherapy, radiation or mutilating surgery. In the process of her research, she discovered that there are known causes for virtually every disease, even though this is never taught to doctors in medical school. High blood pressure, diabetes and heart disease Cancer: all types including leukemia and AIDS Arthritis, lupus and sciatica Allergies, asthma and bronchitis Multiple sclerosis, Parkinson's and Alzheimer's Stomach ulcers and diseases of the colon Special problems of women including menopause and osteoporosis Flu, colds, headaches, chronic fatigue syndrome, fibromyalgia and many other diseases. [Hamer] German New Medicine- How You Control Your Own Healing. Dr. David Holt talks about German New Medicine. Creating a Heart Attack- An Animal Study. In this video, Dr. David Holt, the leading U.S. physician in German New Medicine, explains that the conventional explanation for heart attacks may not be accurate at all. Conflicts involving territorial loss -- such as losing a family member, your home, or your financial stability -- cause changes in the coronary arteries of all animals -- including humans. Chapter 3 "The Gerson Institute"
Chapter 5 "Detox; Clinic patients"
Chapter 7 "Medication, Organic farming"
Chapter 8 "Our depleted food"
Chapter 10 "Osteoporosis, Pancreatic Cancer"
Chapter 11 "Epilogue; What matters"
Steve Kroschel's Award Winnind 2nd Documentary on The Gerson Institute. See doctors try to discredit Dr. Max Gerson's theories with no evidence and see Japanese doctors who are currently doing a study on more than 500 patients in Tokyo...including themselves. The doctor that started it, went on the Gerson THerapy and cured himself of metastacized colon cancer. Knowledge is Power! [G. Edward Griffin.] A World Without Cancer (part 1 of 6) What you are about to watch does not carry the approval of organised medicine. The Food and Drug Administration, the American Cancer Society, and the American Medical Association have labelled it "fraud" and "quackery". In fact, the FDA and other agencies of government have used every means at their disposal to prevent this story from being told. They have arrested citizens for holding public meetings to tell others of their convictions on this subject. They have confiscated films and books. They even have prosecuted doctors who apply these theories in the effort to save the lives of their own patients. The purpose of this movie is to show that this great human tragedy can be stopped now entirely on the basis of existing scientific knowledge. The information you are about to watch marshals the evidence that cancer is a nutritional-deficiency disease, like scurvy or pellagra. It is not caused by a bacterium, virus or mysterious toxin, but by the absence of a substance that modern man has removed from his diet. That substance is Vitamin B-17, also known as Amygdalin or Laetrile. If that analysis is correct, then the treatment and prevention of cancer can be made simple. All that needs to be done is to restore that easily obtained and inexpensive food factor to our daily meals. An increasing number of doctors all over the world are now are testing and proving in their own clinics that the vitamin concept of cancer is true. Gaston Naessens Somatoscope. A revolutionary video showing the incredible microscope of Gaston Naessens, called the 'somatoscope' which breaks the laws of physics to show you living organisms at 30,000X magnification and 150 Angstrom resolution showing living organisms without any type of slide preparation or staining. You will see the Somatid which lives in all living organisms (including humans), which is a shape changing (pleomorphic) organism responsible for cancer and many other degenerative diseases. Naessens invented his incredible microscope over 40 years ago and has invented a substance called 714X which has successfully treated cancer and other degenerative diseases in many people. Hoxsey: The Quack Who Cured Cancer? 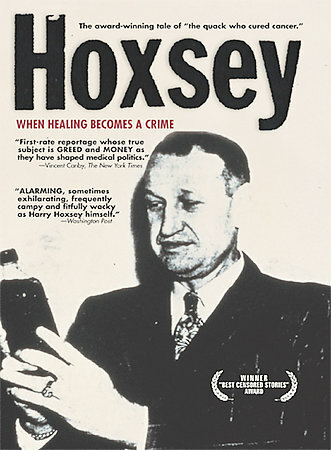 Hoxsey - How Healing Becomes A Crime. This documentary concerns Harry M. Hoxsey, the former coal miner whose family's herbal recipe has brought about claims of a cancer cure. Starting in 1924 with his first clinic, he expanded to 17 states by the mid 1950s, along the way constantly battling organized medicine that labeled him a charlatan. Hoxsey's supporters point out he was the victim of arrests, or "quackdowns" spearheaded by the proponents of established medical practices. Interviews of patients satisfied with the results of the controversial treatment are balanced with physicians from the FDA and the AMA. A clinic in Tijuana, Mexico claims an 80% success rate, while opponents are naturally skeptical. What is apparent is that cancer continues to be one of humankind's more dreaded diseases, and that political and economic forces dominate research and development.